Regnet kom og forsvant igjen fort. Det er slik her - det dårlige været varer som regel ikke lenge. Nå skinner solen igjen fra skyfri himmel og jeg må forsøke å finne noe spennende å lage til middag. God mat fører alltid til at stemning blir bra igjen, og Nigel trenger en liten oppmuntring etter alt strevet med det tekniske i dag. Dagens bilde viser funikularbanen som vi tok opp til den øvre bydelen igår. Today, we spent most of the day solving yet another technical problem. During the morning we had some heavy rain. Just as the rain was at its worst we lost the shore power. The rest of the boats in the harbour lost their power too. After analysing the problem for a while Nigel found out that our battery charger was the problem. If the sudden power failure caused the battery charger to fail or if our battery charger caused the power failure - we do not know. Nigel spent almost a couple of hours just taking the part out of its place in one of the cupboards. It seems like they build the boat around the equipment. It was many screws that had to be unscrewed and shelves removed before the part was finally out of its socket. Nigel and an electrician from another boat could finally determine that the battery charger was "kaputt". Nigel went to the nearby boat repair place who order a new one for us. This new battery charger will arrive on Wednesday. I looks like we are thus stuck here until Ole and Inger Lise arrive on Friday to crew with us to Madeira. The rain came and went just as quickly. It is like that here - the bar weather never seem to last long. Now, the sun is shining from a cloudless sky, and I have to find something exciting to make for dinner. Good food is always a moral booster they say. And, I think Nigel need to be cheered up a bit today. 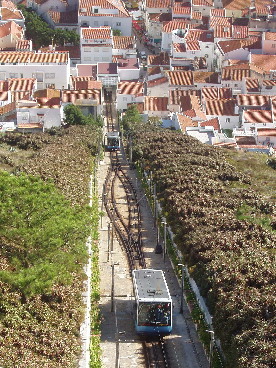 Today's picture shows the towns funicular railway which we took to the upper part of the town yesterday.